Just in time for Spring, this recipe for Orange Chiffon Cake with Edible Flowers is both scrumptious and gorgeous. 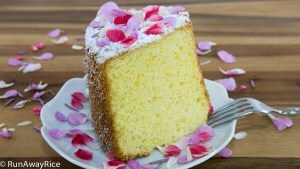 Fragrant with the essence of fresh oranges, the cake is moist and super fluffy. 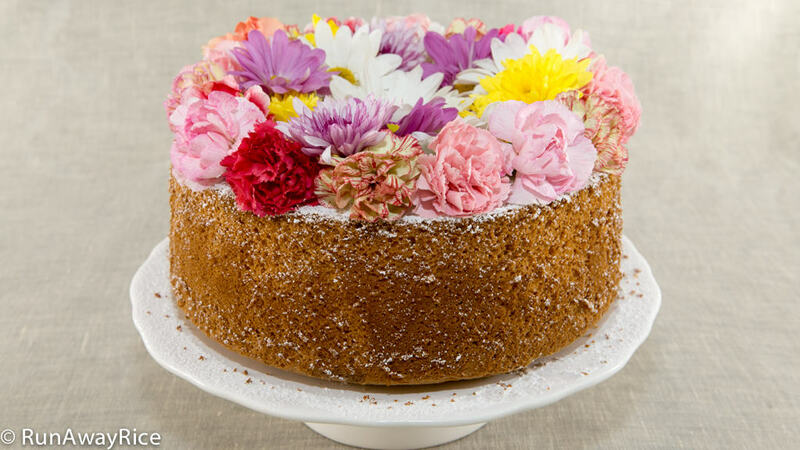 The crumb coating is delicate and combined with the edible flowers gives the cake a casual and earthy note which makes it perfect for casual dining or get-togethers. 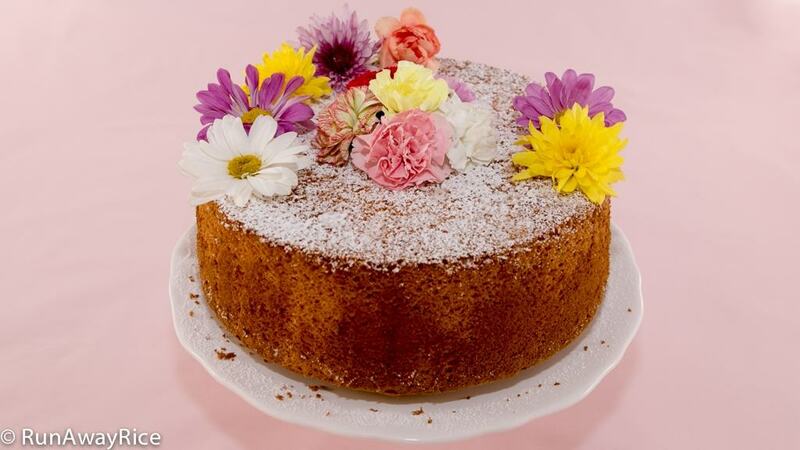 Make this cake for your next springtime gathering (Easter, Mother’s Day, Bridal or Baby Shower) and watch it become the center of attraction. If you’re new to enjoying edible flowers, purchase the packaged mixes at your grocery store or farmer’s market. This way you can try an assortment of flowers and decide which ones you like. In the stores, edible flowers are usually packaged in small plastic containers and stocked in the produce section. I purchase my edible flowers at Whole Foods Market. To prepare the flowers for eating, gently rinse with cool water. Shake off the excess water or use a salad spinner to dry. Store in the refrigerator in a sealed container or plastic bag until you’re ready to use. They will last for 1 week in the refrigerator. I like serving the cake with the flat surface (bottom of the pan) on top. If the cake doesn’t sit evenly on the plate because it’s domed, trim off a thin layer. The cake is best enjoyed within 3-4 days. Cover the cake and store at room temperature or in the refrigerator. The cake can be frozen for up to 2 months. To enjoy again, thaw at room temperature. If you enjoyed this recipe, you may also like: Cotton Cheesecake/Japanese Cheesecake or Sponge Cake. Separate the whites from the yolks for the 6 eggs and place in separate bowls. Separate 1 extra egg white and add to the other egg whites. Allow the eggs to come to room temperature (approximately 30 minutes). Position the oven racks toward the lower portion of the oven. Preheat the oven to 325 degrees Fahrenheit. Sift the cake flour into a large mixing bowl. Add 1 cup fine sugar, baking powder and orange zest. Mix on Low speed for 20 seconds. Add the egg yolks, orange juice, vegetable oil and vanilla extract. Mix on Medium Low for 30 seconds. Scrape around the bowl and work in any dry ingredients. Mix for another 30 seconds. Scrape around the bowl one more time and mix on Medium Low for another 30 seconds. Add 1/3 of the egg whites to the batter and gently combine using a large whisk. Add in the next 1/3 of egg whites and repeat the process. Add in the remaining portion and again gently combine. Pour the batter into a tube pan/angel food cake pan. Take a bamboo skewer and drag it through the batter a few times to remove any air pockets. Optionally, tap the pan against the counter a few times. Put the pan in the oven and bake for 55-60 minutes. Check the cake for doneness by inserting a bamboo skewer into the cake. It should come out clean. Remove the pan from the oven and invert it. Allow the cake to cool upside down for 1 1/2 hours. Run a spatula around the pan to loosen the cake and then remove the cake from the pan. Use the spatula to loosen the cake from the pan bottom making sure to loosen along the center tube as well. Transfer the cake to a serving plate. 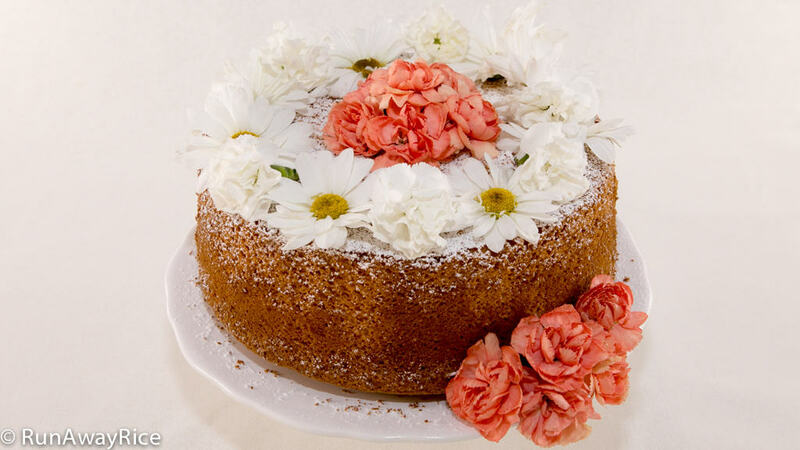 Dust the cake with a generous amount of powdered sugar and the decorate with assorted edible flowers. 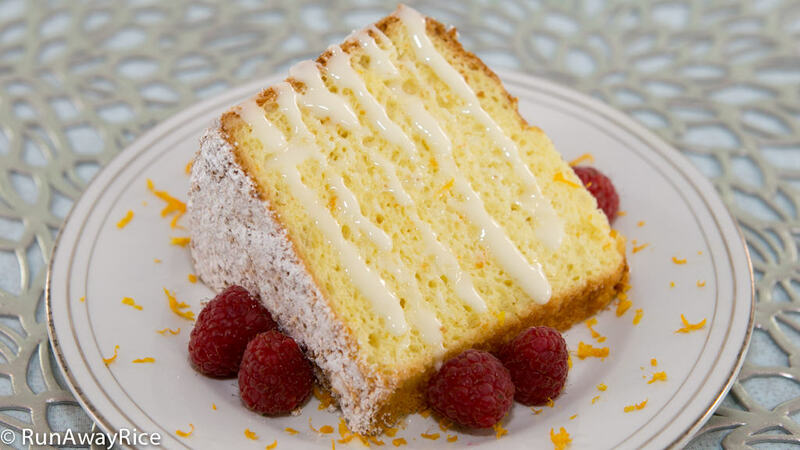 Optionally serve with fresh fruit, whipped cream or the glaze below. Enjoy! 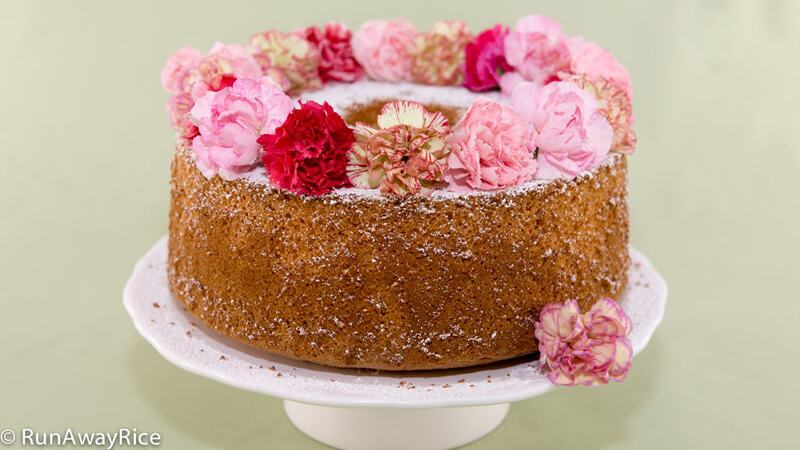 Add more decadence to the cake by making this sweet glaze. Add the orange juice and zest into a large bowl. Add the powdered sugar a little bit at a time and mix together. Continue until all the sugar is added. Drizzle over the cake or serve on the side. Some pictures to inspire you to make this gorgeous cake! where can i get edible flowers? I buy them from farmers’ markets or health food stores. If you are in the US, Whole Foods sells edible flowers. I hope that helps!